I now live with two toddlers. One that is trying to start the terrible twos early and one that is trying to extend them into his third year. We don't spank in our house. We don't even do time outs. We just ask if whoever is having a melt down needs to "take a break" - and sometimes that's mommy. In fact, I'd be fine with being sentenced to time out. Send me to my room. Let me sit in quiet contemplation while no one bothers me until I am ready to rejoin the family. That sounds like heaven! 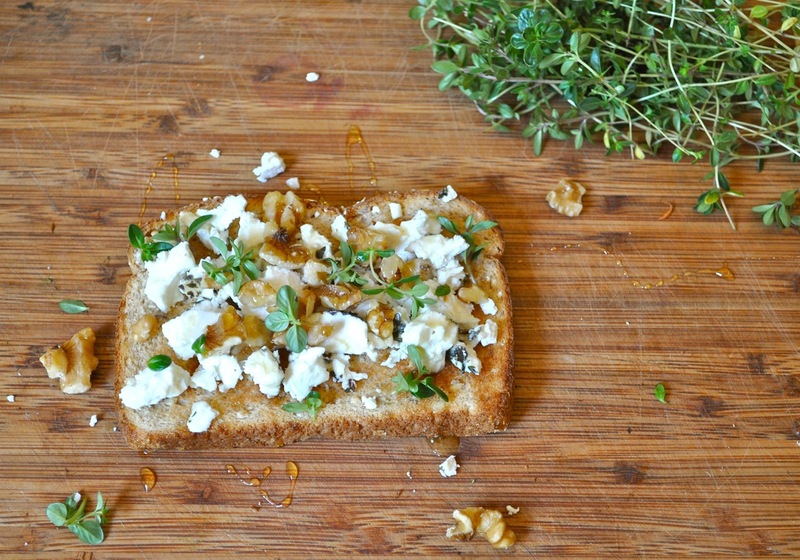 Equally heavenly, was in a rare non-crisis moment the other day when I was able to make and enjoy this thyme toast. Toast the bread lightly. Smear with the cheese. I had an herbed variety on hand, but plain would do too. Sprinkle with nuts. Top with sprigs of thyme. Mine came from my CSA this past week. Then drizzle with honey. I like local honey best for so many reasons, not the least of which is taste. 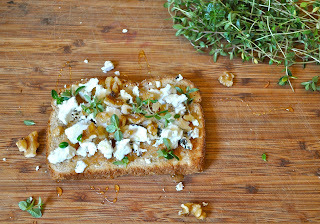 Take a break and make this toast. Nutty, creamy, sweet, and savory - it has it all. Plus, it is simple enough to throw together and eat in between temper tantrums. "Be right there kids. Mommy is in a thyme out!"